If you're after a fun DIY project then this is for you. 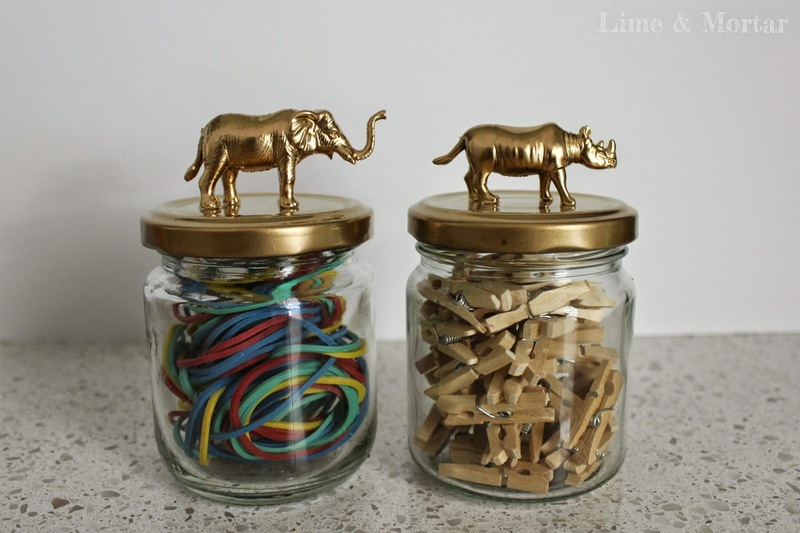 With so many purposes these jars will look great in all rooms of your home. They also make a great gift for others too. 1. Remove all the lids from the jars. 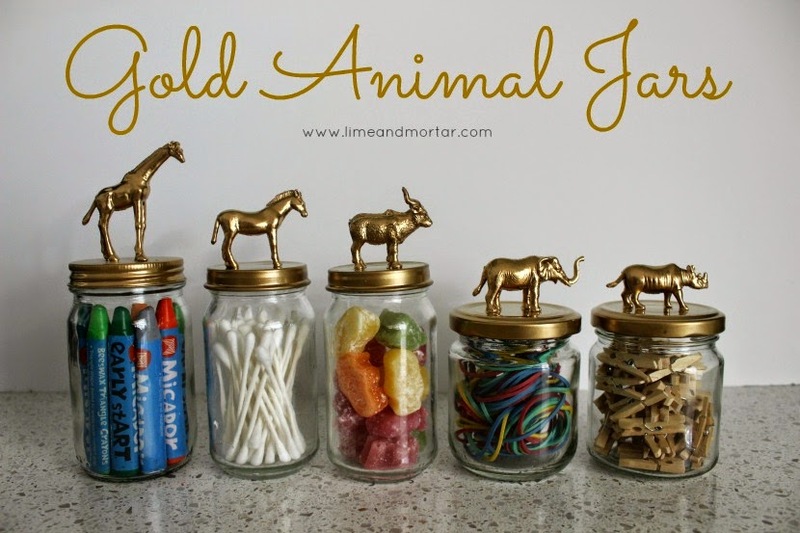 Squeeze a little glue onto each foot of the animal and stick onto the lid in the centre. Only use a small amount as you dont want the excess glue to squeeze out under the feet. 2. Once the glue is dry (time will vary depending on your chosen glue) place the lids on some cardboard and lightly spray with the gold spray paint. I did a few light coats and touch ups where needed. Dont forget to spray under the animal also. 3. 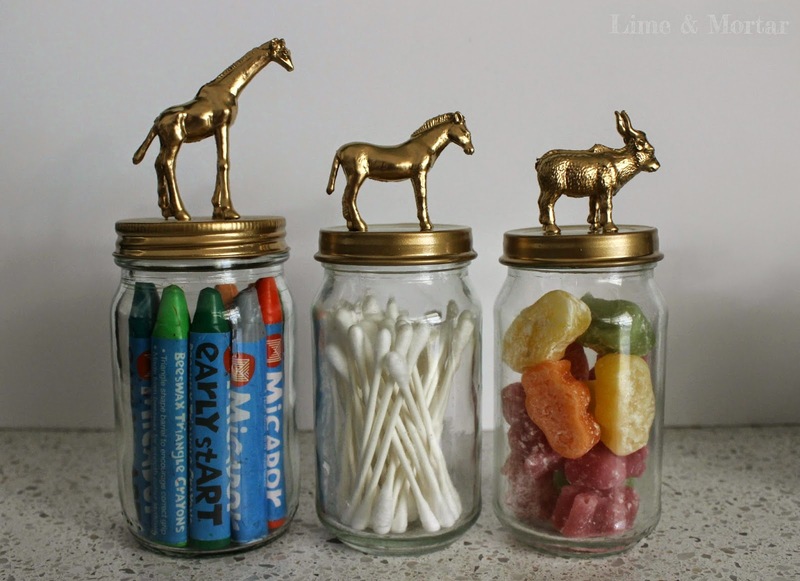 Once your lids are dry fill the jars with whatever you like - crayons, cotton buds, lollies, rubberbands, mini pegs... so many options. Display around your home for quirky cute decor. **I received the Dulux Gold Duramax Spray Paint for the purpose of review. However the ideas, items and opinions are of my own. Full review to come. Looks good Leanne. Can you please report back on these in a few months to see if the paint is still in tact? These are gorgeous Leanne! My next shop will be for product in nice jar shapes to recycle when empty for this! Thanks for sharing!